Choose from 270 luxurious bedrooms, including 13 exclusively decorated suites. Bedrooms, are in muted colours with sensual fabrics and with spacious bathrooms, ensuring that guests enjoy the finest comforts and the ultimate in relaxation. Some rooms also have CD players, Videos or DVD players. All rooms at Gleneagles now have Interactive Televisions. Single Rooms are individually decorated with a variety of views. Many connect with neighbouring rooms, also ideal for families and larger parties. gardens or towards the Perthshire Hills. 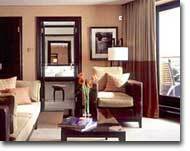 Or spacious rooms, some with their own comfortable sitting area. 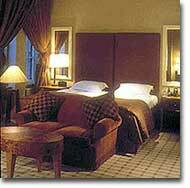 Many of the double rooms have king sized beds. towards the Glendevon Valley at the foot of the Perthshire Highlands. 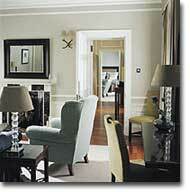 Estate Suites have a separate sitting room and king size beds. courts with the Perthshire Hills behind or towards the golf courses. main driveway up to the hotel. breakfast or for private cocktails and dinner parties. woven carpets are complemented by breathtaking views of Glendevon. to the rolling skyline of the Ochil Hills. Please provide us with your details in the form below. We will contact you with the information you have requested. ®The Gleneagles word and the Eagle device are trade marks. © Copyright 1997 - 2018 Noble Media by Au Fine Art. All Rights Reserved.